Quick Start Guide to Swift: Part 1 | Yeah, But Is It Swift? 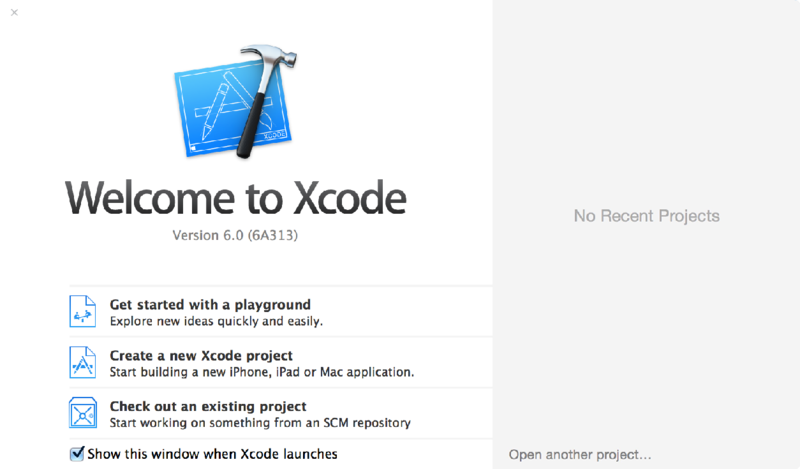 Let’s start by installing Xcode 6. You can download it from the Swift Resources page. Of course, you’ll need a Mac and OS X to run Xcode, but if you’re on a different platform then you can still read through this tutorial and learn a lot about the language. Once installed, launch Xcode 6. You’ll be greeted by Xcode’s Welcome window. From here you can immediately start experimenting with Swift by opening a new playground file. But what is a playground? Playgrounds make writing Swift code easy and fun. When working from a playground file you can type lines of code and see the result immediately. There is no need to create and build an Xcode project. 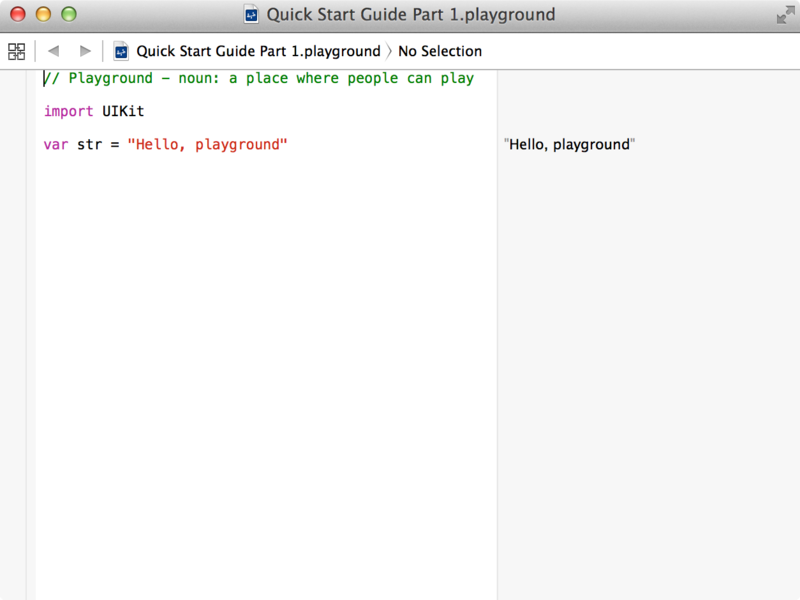 Playgrounds is a perfect interactive environment for learning Swift and trying out new ideas. For that very reason we’ll use it during this tutorial series. Okay, let’s create a playground to work from. Figure 1. Getting started with a playground. Do that by selecting the Get started with a playground option from Xcode’s Welcome window. A new window will appear where you can set the name for your playground file and your target platform. 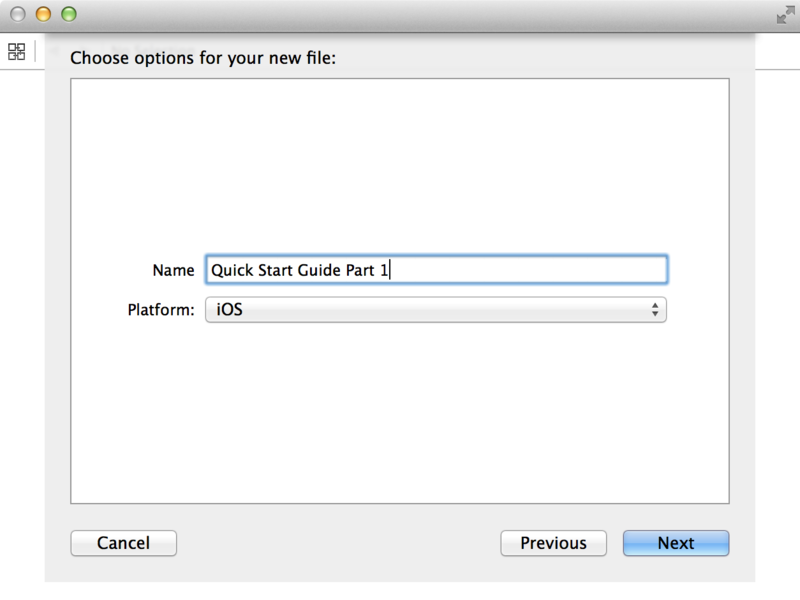 Ensure the target platform is set to iOS and name your file Quick Start Guide Part 1. Click Next then select a suitable location on your hard drive to save the playground file to. Finally, click Create. Figure 2. Naming your playground file. Congratulations! You’ve just created your first ever playground file and are now ready to start experimenting with the Swift programming language. You’ll be presented with a window that’s split into two columns. Figure 3. Your playground window. On the left-hand side is where you’ll enter your Swift code. In fact, you should see some default code already sitting there. On the right is a sidebar where the results of your evaluated code will be shown. Your playground window also provides a timeline assistant, which comes in handy when working with code that runs over time. For example, if you write a loop, you can watch its progress in graph form, with the value of each of the loop’s variables clearly charted over time. However, focusing on the sidebar for the time being will be more than enough to get us up and running. Feel free to delete the code that’s already within your playground. Now let’s get the ball rolling. If you were to save the above within a text file and give it the .swift extension, you’d have written the simplest program you can write with the Swift programming language. That’s right, just a single line of text and you have a working program. Any code written at the global scope is used as your program’s main entry point, and there’s no need to import a library to handle output of your string either. You may also notice one curious omission. There’s no semicolon at the end of the line. Semicolons aren’t required at the end of every statement. Adding semicolons to the end of a statement is a hard habit to break. Hang on in there though and you’ll soon learn to live without them. Try the above example out by typing it into your playground window. Hitting the Enter key will result in Hullo World! being displayed within the sidebar. If we were running our code from an Xcode project rather than a playground, then Hullo World! would have been displayed within Xcode’s console panel rather than your playground’s sidebar. There are various destinations that text can be written to depending on the context in which you are running Swift. It’s therefore better to refer to those destinations collectively as the appropriate output. We’ll use that term throughout. // Player has been killed. Unlike most languages, multiline comments can also be nested inside other multiline comments. This is particularly useful if you need to quickly comment out large blocks of code that already contain multiline comments. Use constants for any values that will not change during the lifetime of your program. When you declare a constant you must also provide it with an initial value. Unlike a constant, a variable does not require an initial value when being declared. However, a value must be assigned before the variable is actually used. In most situations however, you shouldn’t need to explicitly state the type you intend to use. Swift provides types for integers, floating-point numbers, strings, characters and boolean values. However, it’s recommended that you use Int even for values that are known only to be non-negative. This avoids the need to convert between different number types. Use Double only when you require the additional precision or to store a number that’s too large to be represented by Float. In the example directly above, notice that the value 1 is written as a floating-point value (1.0). This is to ensure that the value3 constant is implicitly declared of type Double. If two integers had been divided instead, Swift would have incorrectly inferred that an integer type was to be used for your value3 constant, which would have resulted in it being initialised with a value of 0. If you examine the sidebar you’ll notice that value3 contains a value of 0, which is probably not what you expected. Of course, with all three variables above, you could have declared each as being of type Bool. However the use of the Bool type is inferred by assigning either true or false to each. As expected, in the example above, the String type is inferred by the fact that a string literal is used to initialise each constant. It’s worth noting that a Swift string is a value type. In other words, the value of the string is copied when passed to a function or method. The same is also true when a string is assigned to another constant or variable. This is different to the behaviour of Objective-C where a reference to a string is used instead. Strings that are represented by constants cannot be modified once they are initialised. The example above will print Vader vs. Yoda to the appropriate output. In the example above, the value of the finalScore constant is calculated by multiplying the value of numberOfKills with remainingTime. However, since numberOfKills and remainingTime are both of different types, one of the types must first be converted to match that of the other. In our example, this is done by calling UInt16(remainingTime) to convert the remainingTime constant to the same type as numberOfKills. A conversion from floating-point to integer is always truncated. For example, 5.9 will become 5, whereas -3.9 will be converted to -3. The example above creates three variables (width, height, and screenType) and assigns each of them to a value within the tuple. Tuples are ideal for temporarily storing groups of related data. They are also an extremely powerful means of returning multiple values from a function or method. They aren’t however, suitable for representing complex data structures. We’ve already created a tuple to store details regarding a non-Retina iPad. Try adding three new constants that represent the Retina iPad, non-Retina iPhone, and the Retina iPhone 4. Now create a variable named currentScreen and arbitrarily assign it to the various constants. Using that variable, extract values from each and print them using the printlin() function. It was stated earlier that a variable or constant must be assigned a value before it can be used. How do we handle variables that, for one reason or another, may not hold a value at various points during your program’s execution? Swift provides nil, which is a special value that represents a valueless state. After all, not everyone has a middle name. Unfortunately Swift variables cannot be nil. They must always have a value associated with them. Notice that, in this case, the optional string type has to be explicitly stated. It’s also defaulted to nil. Before you can unwrap an optional though, you must first check that it contains a value. In other words, you must check that your optional is not nil. We used an if statement in the example above but haven’t yet covered control flow yet. It should be fairly obvious how it works though. By using the exclamation mark to obtain the optional’s value, you are stating that you are absolutely sure that the optional does actually contain a non-nil value. This is known as forced unwrapping, and doing so on a variable that contains nil will result in a runtime error. You’ll be using optionals a lot in Swift so try to get comfortable using them. Create a few optional constants. Each optional should be initialised to a string literal that contains the name of a friend. Print each of your friend names (one println() for each friend) and check the result in the sidebar. Verify that you’ve actually unwrapped your optional by checking that the keyword Optional doesn’t appear in the sidebar next to each of your println() statements. Now go back and initialise each of your constants to nil. Ensure that nothing is now being printed to the sidebar and confirm that you aren’t receiving any runtime errors. The example above checks to see if the middleName optional contains a value. If it does then it sets a new constant called name to the value contained within middleName. That constant is then made available within the first branch of the if statement. Also, since the name constant has already been initialised with the value stored within the optional, there is no need to forcibly unwrap it with an exclamation mark. The name constant is a string rather than an optional. In other words, the name constant is a non-optional type. Sometimes you’ll want to work with an optional that you know for sure will always have a value after it’s first set. For example, you may write a video game that loads the current highest score from the file system. Initially your variable will contain nil while the high score is being loaded, but once that high score is set, the structure of your game guarantees that your variable will always contain a score. In such cases, checking and unwrapping the optional every time you want to access its data is unnecessary. You can actually remove the need to do this by using an implicitly unwrapped optional. Notice that there was no need for an exclamation mark immediately after the highScore variable on either lines. Revisit the previous playground experiment but this time use implicitly unwrapped optionals. Swift’s basic operators will be familiar to most developers. It also provides support for a few special operators such as the nil coalescing operator and two range operators. We’ll cover the range operators shortly but will leave the nil coalescing operator for another day. We’ve already seen the assignment operator (=) used to initialise variables and constants, and of course it can just as easily be used to assign the value of one variable to another. This feature prevents the assignment operator from accidentally being used when the equal-to (==) operator was actually intended. As you would expect, the standard arithmetic operators (+, -, *, and /) are all supported by Swift. Swift supports all the usual comparison operators found in most other languages: equal to (a == b), not equal to (a != b), greater than (a > b), less than (a < b), greater than or equal to (a >= b), and finally, less than or equal to (a <= b). Swift has support for the three standard logical operators: logical AND (a & b), logical OR (a | b), and logical NOT (!a). Of course, you can also combine multiple logical operators to create longer compound expressions. Swift provides a closed range operator and a half-open range operator. These operators are useful when expressing a range of values. More on loops in the section directly below. Swift provides a for loop and a for-in loop. Let's begin with the for loop. In order to see the results of a loop within your playground you'll need to take advantage of the timeline assistant. To do this, look in the sidebar, directly along from your loop's println() call. You should see the text (5 times) and an icon of a dot to the right of that. If you click that icon, the timeline assistant pane will open and you'll be able to see the result from each iteration of your loop. Write a small program that calculates the sum of numbers between 1 and 100 inclusive. Print the result. The for-in loop is used to iterate over collections of items. This can include such things as a range of numbers, items in an array, the contents of a dictionary, or the characters in a string. This is functionally equivalent to our for loop example and will result in the same output being printed. In the example above, the closed range operator (...) is used to define a collection of numbers from 0 to 4 inclusive. On each iteration, a constant named index is created and set with the current value from the range. By default, a for-in loop uses a constant, therefore there is no need to explicitly use the let keyword when providing the constant with a name. As with the for loop, block scope is important. The for-in loop's constant only exists within the scope of the loop. Once again, write a program that calculates the sum of numbers between 1 and 100 inclusive. This time, use a for-in loop rather than a for loop. Swift provides two types of conditional statements: the if statement and the switch statement. We'll discuss the switch statement in a future article and focus on the various flavours of the if statement at the moment since they are more commonly used. As with for loops, parentheses aren't required when working with if statements. The final else clause isn't mandatory and can be dropped. I hope you've found from this tutorial that there's nothing particularly difficult about the Swift programming language. No matter what your development background is, everything covered (perhaps with the exception of optionals) should have felt familiar. We're certainly not in a position to go ahead and get something running on a device yet, but stick with this series and we will get there. In the next tutorial we'll take a look at Swift's two collection types: arrays and dictionaries. We'll also take a closer look at a few subjects that we touched upon today. Specifically, we'll spend more time looking at strings, and also cover a few more control flow statements including while loops and the switch statement. In the meantime keep experimenting with playgrounds. If there are things that you haven't quite grasped then spend a little time going back over this tutorial and trying things out until they're clear in your head.